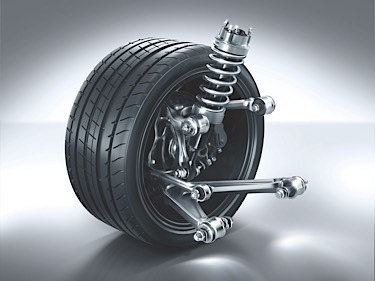 With wide adoption of large diameter wheels and low-profile tires, suspensions on late-model vehicles have changed. 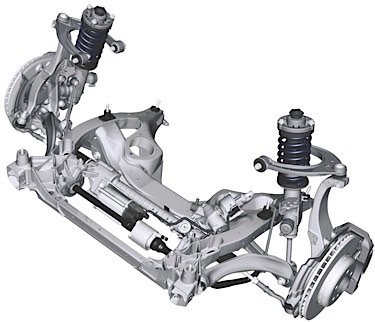 The extra weight of larger wheels has meant that suspension components have had to go on a diet of aluminum. Less sidewall area has transferred the role of absorbing road impacts to larger bushings in order to achieve the same ride quality. This has changed how suspensions are inspected and serviced. Also, it has changed how you can order replacement components. Here are ten tips to help you service these modern suspensions. 1. Look up the service information: Every OEM has their own inspection and replacement procedures for suspension components. Some recommend replacing a bushing by measuring deflection. Others may recommend replacement based on the depth rather than the length of cracks in the rubber components. Not following the proper procedures can mean replacing bushings unnecessarily or damaging the replacement component. 2. Look for leaking fluid: Some modern control arm bushings are hydraulic. They push fluid between chambers to control the movement of the bushing and absorb vibration. These bushings are tuned to the vehicle and tire package. If a leak is detected, replace the bushing or control arm. 3. Use a torque wrench: Many aluminum control arms and knuckles can be damaged if the improper tightening method is used. A lot of these fasteners are torque-to-yield (TTY). These are designed to stretch when installed to ensure the fastener does not lose its clamping force over time. Some are designed to be used just once and discarded. Never over-torque a ball joint stud. The extra torque could break the stud and potentially damage the knuckle. Look up the specification and use a torque angle gauge. 4. Never use an impact wrench to install: Modern ball-and-socket joints on a suspension use a metal ball that is surrounded by a plastic sleeve in the socket. Spinning the stud with an impact wrench can cause heat and friction that can damage the new part. 5. Be careful of upgraded or solid replacement bushings: Often a company will market a solid bushing to replace a hydraulic bushing. These may work for a track car, but on the road it can be a brutal ride. 6. Look for “loaded” options: Complete replacement control arms and suspension links can be a more economical replacement option over replacing just the bushings. Depending on the application, the labor saved at the press can offset the price of a complete control arm. This means a more complete repair as well as a more productive shop. 7. Tighten the bushing when the suspension is loaded on some applications: Many bushings need to be tightened to the final torque specification with the suspension loaded. Failing to do this may result in damage to the new bushing. 8. Install alignment kits and cam bolts now: Most modern vehicles are “net build” and do not have adjustments built-in for camber or caster. 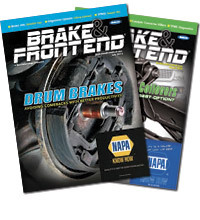 If you are installing a new bushing or control arm, take a look to see if there is an alignment kit available for the vehicle. This can save a lot of unnecessary labor when the vehicle is aligned. 9. Investigate the failure: Often, a rubber bushing will fail because of exposure to extreme heat or fluids from the engine or transmission. If the problem is not addressed, the new component will fail sooner than expected. In many cases, a worn axle seal on a transmission or transfer case can kill a control arm bushing very quickly. 10. 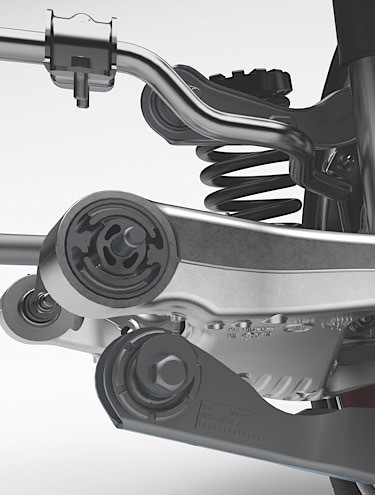 Expect that you will have to thread lockers and specialty bolts: Many vehicles are using cast and forged aluminum suspension components. Fastening aluminum to steel can cause galvanic corrosion issues. Many automakers use coated threads on fasteners that help to prevent corrosion. Some of these bolts may have a chalky, black or even green coating or plating. Some of these fasteners should not be used twice. Also, many vehicles are using chemical thread lockers to secure bolts.